A seaport on the Mediterranean, Oran is the second largest city in Algeria and a major trading and industrial center. Called Wahran (also spelled Ouahran) in Arabic, Oran is located in Western Algeria near the border with Morocco at a point where Algeria is closest to the Spanish coast. Founded in the 10th century by Andalusian merchants, Oran was incorporated into the Kingdom of Tlemcen and served as its main seaport after 1437. The Beni Zian rulers of Tlemcen, unlike the Almohads that preceded them, displayed a more favorable attitude towards the Jews and invited them to settle in their kingdom probably already in the early 14th century. However, the first mention of a Jewish community in Oran dates from 1391, when Jewish refugees arrived in the city having escaped the anti-Jewish persecutions in Spain. A discussion about the customs of the local Jews is one of subjects of the correspondence conducted by Rabbi Amram ben Merrovas Ephrati of Valencia, who settled in Oran, with Rabbi Yitzhak bar Sheshet (Ribash) (1326-1408) and Rabbi Shimon ben Semach Duran (Rashbatz) (1361-1442), both Spanish refugees from Barcelona and Majorca respectively, who moved to Algiers. The Jewish population of Oran increased towards the end of the 15th century with the arrival of immigrants from Spain. In 1492 and again in 1502 Oran received groups of Spanish refugees, both Jews and Muslims, fleeing from forcible conversion to Christianity. In 1509 Oran was captured by Spain in a military campaign launched at the initiative of Cardinal Ximenes (Jimenes) de Cisneros (1436-1517), the Archbishop of Toledo. Although the first intention of the Spanish troops was to expel the Jews from the city, it was not long before a few families were allowed live in the region. Oran remained under Spanish dominance for most of the next three centuries. While in Spain and its colonies there was a total ban on Jewish presence and crypto-Jews were persecuted by the Inquisition, in Oran the Spanish monarchs tolerated for much of the 16th and 17th centuries the existence of a small but influential Jewish community. Thus the small Spanish enclave of Oran along with the nearby port of Mers el-Kebir remained the only place in which the old Spanish convivencia of Christians, Muslims and Jews continued for another century and a half. A list from 1530 mentions about one hundred twenty five Jews of Oran as enjoying the protection of the King of Spain and another seventy two Jews who lived in the area and who did not enjoy the same legal status. Additional lists from 1591 and 1613 mention about one hundred twenty five and two hundred seventy seven Jews, respectively. The Jewish population stayed within the same limits for most of the first half of the 17th century, including a number of “foreign” (forasteros) Jews who were permitted to reside in the Spanish territory. The Jews of Oran lived in a distinct district of the city where they had a synagogue and continued the practice of Judaism openly. They also maintained relations with other Jewish communities in North Africa and around the Mediterranean. These relations along with a knowledge of both the Arabic and Spanish languages turned into important assets that contributed to the commercial success of the Jews of Oran. Their contribution to the local economy as agents and mediators between the Spanish enclave and the Muslim hinterland assured them the protection of the royal authorities against the Inquisition. Much of the economic and political power of the Jewish community was concentrated in the hands of a few dominant families. They included the Bensemero (also spelled Benzemero, Bencemerro or Zamirrou) family, and especially the Cansino family, originally from Seville, who were among the residents of Oran when the city was captured by the Spanish in 1509, and the Sasportas family who reportedly came to Oran from Barcelona. Although intermarried, the Cansino and the Sasportas families maintained a strong rivalry for generations; this conflict attracted the attention of the Spanish authorities and probably contributed to their decision to expel the Jewish community of Oran. In 1669 the Spanish Queen Maria of Austria decided to expel all the Jews of Oran and its vicinity. The Jewish population, estimated at about 450 persons, was given eight days to leave the city. They traversed the Mediterranean for Nice, then under the control of the Dukes of Savoy, and from there some continued to Livorno, in Italy, where they joined the local Jewish community. 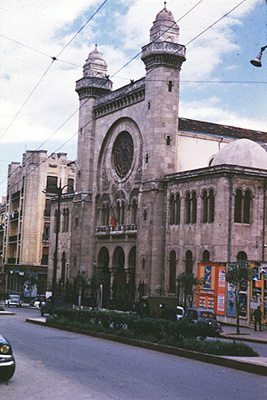 The synagogue of Oran was converted into a church. Jews could return to Oran only in 1708, when the Muslims led by the Bey of Mascara, Mustapha ben Yussef, also known as Bou Shlahem captured the city. The Spanish rule returned to Oran in 1732 and it appears that some Jewish individuals were permitted from time to time to enter Oran and even sojourn there. On the night of October 8/9, 1790, Oran was destroyed by a catastrophic earthquake that caused thousands of casualties. The Spaniards were not interested in rebuilding the city; two years later Spain abandoned Oran and passed it on to Mohammed el Kebir, the Bey of Algiers. The city suffered even more when the remaining population was decimated by a plague epidemic in 1794. Following the restoration of the Muslim governance over Oran, the Jews from the neighboring city of Tlemcen, as well as from Mostaganem, Mascara, and Nedroma responded to the invitation of the Bey of Algiers and settled in Oran. The emerging Jewish community brought a quarter of the town close to Ras el-Ain and was granted land for a cemetery in the district of Sidi Shaaban. The rights of the Jewish community are detailed in an agreement of 1801 that also mentions the names of its leaders: Ald Jacob, Jonah ben David, and Amram. At the same time Rabbi Mordechai (Mardochee) Darmon (c.1740-c.1810), who came from the Jewish community of Mascara, became the mokdem (“president”) of the local community. In addition, Mordechai Darmon played an important role as counselor of the bey (Turkish governor) of Mascara and of the bey of Algiers. He established the synagogue that later was called after him and was the author of Maamar Mordechai (“Sayings of Mordechai”), a biblical commentary published in Livorno in 1787. During the early years of the 19th the Jewish population of Oran grew with the arrival to the city of Jews from other cities in Algeria and Morocco who were attracted by the new commercial opportunities between Oran and the ports of the Iberian Peninsula – Gibraltar, Malaga, Almeria, as well as Italy and southern France. The Jewish community was governed by a mokdem (or mukkadem, a term that sometimes was understood as being the equivalent of the Hebrew title of nagid, head of the Jewish community) who was assisted by a council called in Hebrew “tovey-ha’ir”. The mokdem was named by the bey and his main task was to represent the interests of the Jewish community in its relations with the Turkish authorities. The mokdem was responsible with the payment of the taxes by the Jewish community and he enjoyed an extensive authority over the community. He named the other members of the community leadership, controlled their activities, and raised new taxes. The mokdem was assisted by a sheikh whose authority was limited; his main prerogative was to make sure that the decisions of the mokdem and of the other leaders of the community were implemented and respected and that the community members kept their religious and social duties. All disputes among the community members, including marriages and divorce, were decided by the dayanim (religious judges), with the exception of criminal matters or disputes between Jews and Muslims, who were decided by a qadi (Muslim judge). The security of the Jewish community in Oran was sometimes threatened by political rivalries between the local Muslim leaders and the central Turkish authorities in Algiers, and by the growing interference of the European powers, especially France. In 1805 many Jews of Oran fled to Algiers fearing the aftermaths of a local rebellion. In 1813 some Jews who sided with a local pro-French bey, who rebelled, were executed and other families were deported to Medea, when Oran returned to Turkish central control. In July 1830 Oran was secured by the French troops who prevented a Turkish plan of massacring and deporting the local Jewish population. The event, who later was remembered as the Oran Purim, inspired the piyyut Mi Kamokha (“Who is like You?”) by Rabbi Messaoud Darmon (d.1866), grandson of Rabbi Mordechai Darmon. 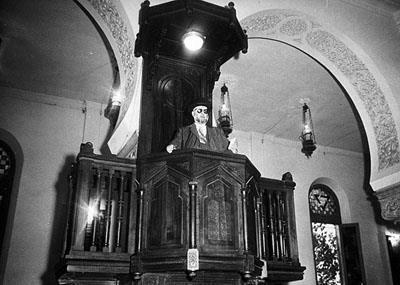 The Jewish community of Oran used to commemorate the Oran Purim by reading the piyyut in the city’s synagogues every year on Shabbat before the 9th of Av. At the time of the French entrance to Oran in 1831 the great majority of the city population was Jewish. According to a census conducted by the French there were about 2,800 Jews in Oran, well ahead of the local Christians and Muslims who together amounted to about 1,000 inhabitants. Under the French rule that lasted until the Algerian independence in 1962, Oran turned into a modern port and the adjacent strategic town of Mers el-Kebir became a major naval base. Oran, 1930. 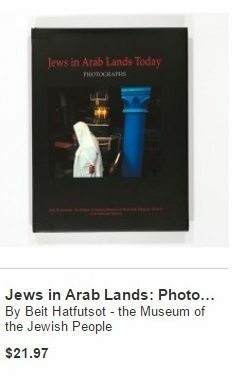 Beit Hatfutsot, the Visual Documentation Center. 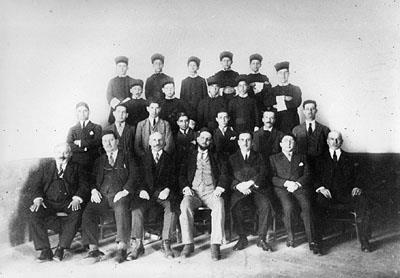 Teachers and rabbis from the Etz Haim school, Oran, 1927. The French administration abolished the old system of government of the community and instead the French system of consistoire was introduced. The Jewish community was governed by a Grand Rabbin and a president. A Beth Din (Jewish religious court) was established by the French in 1836; it functioned for five years under the presidency of Rabbi Messaoud Darmon before it was canceled by the French authorities. Messaoud Darmon became Grand Rabin of Oran in 1844 and kept this title until his death in 1866. The religious tradition of Oran is expressed in its own mahzor (book of prayers): Mahzor Wahran. After 1860 the number of Jews in Oran augmented with the arrival of new Jewish settlers, mainly refuges from Tetuan in Morocco who fled the ravages of the Spanish-Moroccan war of 1859-1860. By the mid 19th century there were about 5,000 Jews in Oran. The community was administrated by a consistoire that had a president and some ten members elected from the local notables. The religious functions were performed by a Grand Rabbin. A report from 1850 mentions another sixteen rabbis, three dayanim, and three shochtim (ritual butchers). During the mid 19th century there were seventeen synagogues in Oran; of them only one belonged to the community while the others were private foundations run by the descendants of the original donor who decided who could attend them. The community was administrated by a number of committees charged with collecting money for the maintenance of the Talmud-Torah and assistance for the needy members of the community. A separate Gemiluth Hassadim organization was in charge of the funerals and assisted the family members during the mourning period. One of the committees was headed by a rabbi and was in charge of the local education. There were about twelve traditional schools that were attended by about 550 students. The first French school was opened in 1849 and by the mid 19th century attracted around 100 students. The beginnings of the Jewish press in Oran are the result of the efforts of Elie Karsenty who started the publication of the weekly La jeunesse israélite in French and Hebrew followed by Magid misharim, a Judeo-Arabic weekly. Moise Setrouk was the director of La voix d’Israël, the monthly official bulletin of the Association culturelle Israelite du département d’Oran. A major change in the legal status of the Jews of Oran, and indeed of the other Jewish communities of Algeria, resulted from the implementation of the law of October 24, 1870, generally known as the Cremieux Decree after Adolphe Cremieux (1796-1880), the Jewish French Minister of Justice at the time. The Cremieux Decree granted full French citizenship to all Jewish inhabitants of Algeria. Four years later the law was restricted to only those Jews who either they or their parents were born in Algeria before the French conquest of 1830. French citizenship gave all male Jews the right to participate in the local municipal elections. Given the high percentage of Jews in the general population of Oran and its region, the newly acquired French citizenship transformed the Jews into an important electoral force. Their electoral impact was even stronger as they generally voted homogenously at the instructions of their leaders, such as Simon Kanoui (d.1915), president of the Consistoire of Oran for many years and sometimes nicknamed the “Rotschild of Oran”, who declared publicly on a number of occasions that nobody would be elected mayor of Oran without his support. During the second half of the 19th century the Jewish population of Oran consisted of a number of distinct groups. The majority were descendants of the initial settlers who came from Mostaganem, Mascara, Nedrona, and Tlemcem. Together with the group made up of later immigrants from Algiers, the villages of the Rif region and the towns of Oudja, Dedbou and the oases of Figuig and Tafilalet, they were known as the “Jews of Oran”. 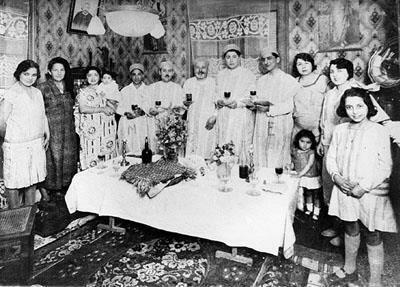 They distinguished themselves from the group of immigrants from Tetuan and especially from other Jews who arrived in Oran from France and other countries of Europe. The Jews of Oran spoke a variety of languages: those of Algerian origin continued to use local dialects of Judeo-Arabic; Tetuani, the name of the Oran dialect of Hakitia, the North African version of Ladino, was spoken mainly by immigrants from Tetuan, but the great majority of Jews had gradually adopted the French language. The construction of the Great Synagogue started in 1880 at the initiative of Simon Kanoui, but its inauguration took place only in 1918. Also known as Temple Israelite, it was located on the former Boulevard Joffre, currently Boulevard Maata Mohamed El Habib. The religious education was advanced by a local Beth Midrash. In the early 1900’s Yeshivat Vezoth LeYehudah was founded in Oran with the help of Yehudah Hassan and of Simon Kanaoui. It continued to function into the first half of the 20th century under the leadership of Rabbi David Cohen-Scali (1861-1947) and was attended by other rabbis of Oran. The occupational structure of the Jewish population of Oran changed gradually in the period starting with the end of the 19th century. If by 1900 the majority of Jews were still traditional artisans – tailors, goldsmiths, shoemakers, bakers, cabinet makers – and unskilled laborers, later during the first half of the 20th century as a result of better education many entered the liberal professions. There were also some women who worked outside home as dressmakers, domestic workers, and typists. It is worth mentioning that the first vineyards in the neighborhood of Oran were planted and owned by Jews. Jews were prominent among the shopkeepers of the city and dealt with a large variety of merchandise. A number of prominent Jews of Oran continued the long established commercial links their ancestors developed for centuries with the neighboring countries and many were engaged in the export of cereals and cattle to the Spanish ports of Malaga, Cartagena, and Algesiras as well as to the British colony of Gibraltar and to France. Already by the mid 19th century, Oran had developed an anti-Jewish atmosphere. Old anti-Jewish bias brought to Oran by Catholic settlers from Spain and France were exploited frequently by local politicians. The first anti-Jewish organization was founded in July 1871 as a direct reaction to the granting of French citizenship to Jews. Anti-Jewish attacks in the local press and even anti-Jewish physical violence preceded by almost two decades the riots exacerbated by the outbreak of the Dreyfus affair. The anti-Jewish campaign had many supporters in Algeria, especially in Oran, and it brought to an aggravation of the anti-Jewish sentiment prevalent among many European settlers in Algeria. Anti-Jewish riots broke out in Oran in 1897 after the electoral victory of the “French Party”. In May 1897 the Jewish quarter and many Jewish shops were attacked by both European settlers and local Muslims. Several Jewish policemen were laid off and Jewish patients were expelled from public hospitals. However, the French authorities refused to cancel the Cremieux Decree which was the principal demand of the anti-Jewish parties and organizations. The anti-Jewish incitement declined after 1902, when the radical anti-Jewish party lost the municipal elections, but Oran remained a major bastion of anti-Semitism in North Africa. Although massive Jewish support and participation in WW1 helped to calm the attacks against the Jews, anti-Semitic attacks returned during the 1920’s only to worsen in the late 1930’s. In 1936 there were new violent attacks against Jews in Oran and its department. When France was defeated by Germany in June 1940, Algeria remained under the jurisdiction of the pro-Nazi Vichy government. The introduction of anti-Semitic legislation followed shortly: in October 1940 the Cremieux Decree was revoked and the Jews of Algeria lost their French citizenship. In March 1941 the racial laws of the Vichy government started to be implemented in Algeria. Jews were expelled from all organizations and associations; they were denied the practice of liberal professions – physicians, lawyers, realtors, insurance agents, nurses, chemists, teachers and educators. Jews were allowed to teach only in Jewish educational institutions, like Alliance Israelite Universelle. Jewish children were expelled from elementary and secondary schools, and the number of Jewish students was set up at three percent. Some Jews, especially young students, joined the anti-Fascist Resistance. In 1942 the Jewish community of Oran sheltered a group of 150 Jews from Libya that had been deported by the Italian Fascist authorities. The landing of the American troops in November 1942 in Oran, one of the main objectives of the Allied invasion of North Africa, ended the anti-Jewish persecutions. Although the racist laws were cancelled relatively quickly, the appointment as Governor of Algeria of Marcel Peyrouton, a former minister of the interior in the Government of Vichy and signatory of the anti-Jewish laws of 1940, delayed the restoration of the full civic rights of the Jews. The Cremieux Decree was reintroduced only one year later, in November 1943, when Charles de Gaulle took over the control of Algeria and after direct intervention from the American administration. Some Jews joined the Allied armies, especially the military units of Free France and participated in the invasion of Corsica and then of southern France, at Toulon, as well as in the campaign in Italy. The years that followed WW2 saw the breakout of the Algerian struggle for independence. After 1954 the conflict between the Muslim population of Algeria and the European settlers turned into an increasingly violent struggle. The Jews strove to remain neutral as much as possible, but soon they too were entangled into the war only to become targets for both the Algerian and French nationalists. Oran, that in the early 1950’s had a majority of European population, was spared for some time from the violence. The city’s Jewish community of almost thirty thousand people continued its regular life, but in February 1956 rioters attacked Jewish property. The attacks worsened in gravity and not before long they claimed casualties from among the Jewish inhabitants of Oran as well. The following years were marked by a gradual deterioration of the security situation; it worsened considerably at the end of 1960 when the Jewish cemetery of Oran was desecrated. The early 1960’s brought about a sharp decrease in the number of Jewish inhabitants of Oran. 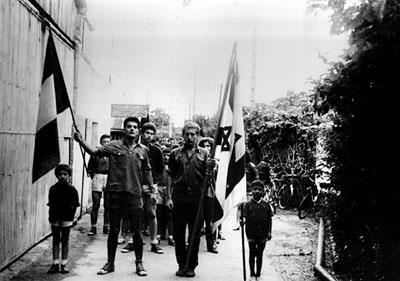 According to the Evian Accords that ended the Algerian war, the Jews were considered European settlers. Legislation adopted by the newly independent Algeria granted Algerian citizenship only to those residents whose father or paternal grandfather were Muslims. Moreover, the Supreme Court of Justice of Algeria declared that the Jews were no longer under the protection of the Law. The great massacres against the European population in June 1962 brought about the immediate exodus of the Jewish community of Oran during the following months. In 1963, a year after Algeria gained its independence from France, there were only 850 Jews left in Oran. In February 1964 a General Assembly of the Jewish Communities of Algeria was held in Oran. The worsening economic situation brought about by anti-Jewish boycott and other discriminations only strengthened in late 1960’s. The departure of the few Jews left in Oran continued throughout the decade with less than 400 still living in the city in 1968. The great majority emigrated to France with Israel as their second main destination. The Great synagogue was converted into a mosque in 1975. By the early 2000’s there do not seem to have been any Jews living in Oran.